Migration Kit Pro - for more complex migrations. In all the scenarios above, Migration Kit Pro will copy your programs, settings and files from your old system to the new one, with no re-installs. And if you have any trouble or need assistance - our support team can resolve even the most problematic cases. You don't have to be a computer guru to use Zinstall. The product is automatic and intuitive to use. 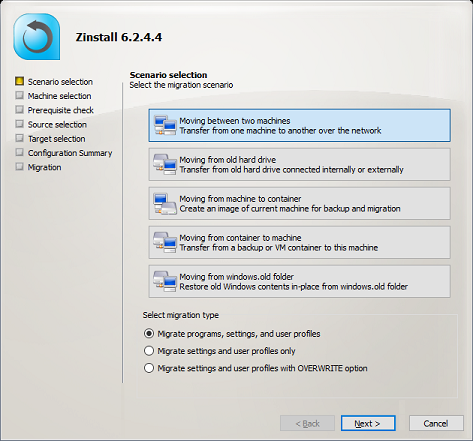 Zinstall Migration Kit Pro works with Windows 10, Windows 8/8.1, Windows 7, XP and Vista, from Home to Ultimate, both 32- and 64-bit. Transfers programs, settings and files even in complex situations.